(UN Photo / Pierre Albouy)Zeid Ra'ad Al Hussein, U.N. High Commissioner for Human Rights, addresses the opening of the thirty-first session of the Human Rights Council in Geneva Feb. 29, 2016. The U.N. human rights chief has lashed out at populists, demagogues and political fantasists like Geert Wilders in the Netherlands, Donald Trump, France's Marie Le Pen and the UK's Nigel Farage, calling them "clever cheats" whose words can trigger "colossal violence." Zeid Ra'ad Al Hussein spoke in The Hague Sept. 5, calling for action to confront European and U.S. demagogues who "blend a fictional halcyon past" with half-truths and oversimplification, resulting in "the banalization of bigotry." This creates an atmosphere "thick with hate that may descend into violence." He said he wished to address a "short statement to Mr. Geert Wilders, his acolytes, indeed to all those like him – the populists, demagogues and political fantasists." Much of their rhetoric is justified as a critique of Da'esh, or the Islamic State, the extremist group which aims to exterminate from its sphere any religion that does not equate with what it calls Islam. "And yet what Mr. Wilders shares in common with Mr. Trump, Mr. Orban, Mr. Zeman, Mr. Hofer, Mr. Fico, Madame Le Pen, Mr. Farage, [the names of some Western populists] he also shares with Da'esh. 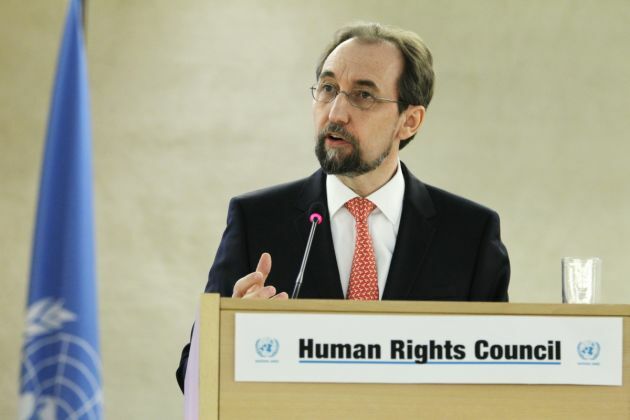 "I am a Muslim, who is, confusingly to racists, also white-skinned; whose mother is European and father, Arab," said Zeid, a former Jordanian diplomat. "And I am angry, too. Because of Mr. Wilder's lies and half-truths, manipulations and peddling of fear. "You see, 20 years ago I served in the UN peacekeeping force during the Balkan wars - wars so cruel, so devastating, which flowed from this same factory of deceit, bigotry and ethnic nationalism," said Zeid. He said he is the global voice on human rights, universal rights; "elected by all governments, and now critic of almost all governments." He defends and promotes the human rights of each individual, everywhere: the rights of migrants, asylum seekers and immigrants; the rights of the LGBT community. He said defends the rights of women and children in all countries; minorities; indigenous persons; people with disabilities, and any and all who are discriminated against, disadvantaged, persecuted or tortured – whether by governments, political movements or by terrorists. Zeid said that what Wilders, Trump and the other share is a seeking in different degrees to "to recover a past, halcyon and so pure in form, where sunlit fields are settled by peoples united by ethnicity or religion." They see that past as one of isolation where people controlled their fate, were free of crime, foreign influence and war. "A past that most certainly, in reality, did not exist anywhere, ever. Europe's past, as we all know, was for centuries anything but that. "The proposition of recovering a supposedly perfect past is fiction; its merchants are cheats. Clever cheats." The UN high commissioner for human rights said that the polulists use half-truths and oversimplification. "The internet and social media are a perfect rail for them, by reducing thought into the smallest packages: sound-bites; tweets." It is to "make people, already nervous, feel terrible, and then emphasize it's all because of a group, lying within, foreign and menacing. "Then make your target audience feel good by offering up what is a fantasy to them, but a horrendous injustice to others. Inflame and quench, repeat many times over, until anxiety has been hardened into hatred." Zeid said empathically, "Make no mistake, I certainly do not equate the actions of nationalist demagogues with those of Da'esh, which are monstrous, sickening; Da'esh must be brought to justice. "But in its mode of communication, its use of half-truths and oversimplification, the propaganda of Da'esh uses tactics similar to those of the populists. And both sides of this equation benefit from each other – indeed would not expand in influence without each others' actions." The UN rights chief said that humanity must pull back from the trajectory propelled by Wilder, Trump and the others. "A decade ago, Geert Wilder's manifesto and Cleveland speech would have created a world-wide furore. Now? Now, they are met with little more than a shrug, and, outside the Netherlands, his words and pernicious plans were barely noticed. "Are we going to continue to stand by and watch this banalization of bigotry, until it reaches its logical conclusion?"